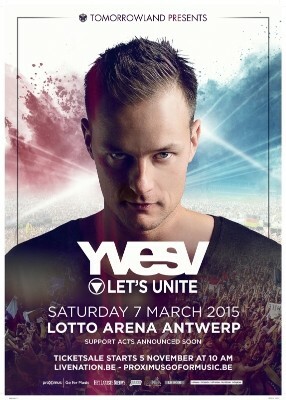 Following a debut at #55 in 2014’s DJ Mag TOP 100 DJs poll, Tomorrowland resident Yves V welcomes a live experience to Antwerp’s Lotto Arena on 7 March 2015, with tickets going on sale via Livenation.be on 5 November at 10AM. Bringing his show to his native Belgium after 12 months touring in far-flung places including India and Brazil, this show will act as something of a special homecoming for Yves, as Let’s Unite will include a massive production curated by the team behind the Tomorrowland festival, along with a selection of special guests. The Let’s Unite show will be the ideal opportunity for homeland fans of Yves V to get a piece of his live set selection enveloped in a live concept event. Expect tracks including the recent iTunes #1 ‘Wait Till Tomorrow’ with Regi & Mitch Crown, along with ‘Old School Sound’ ft Chuckie and tracks such as 'Madagascar' ft Dimitri Vegas, Like Mike & Angger Dimas. With all these being played out, this looks set to be another big gig for the Belgian.